The Ross X-Series Ultra-High Shear Mixer is ideal for products that require great uniformity in a dispersion or emulsion. This inline mixer is often used in processes wherein exceptionally narrow particle size distributions are desired within a single pass. The X-Series delivers more vigorous mixing, greater size reduction and higher throughput compared to conventional colloid mills. In certain applications, even formulations that previously warranted a move to expensive high pressure homogenizers can now be successfully produced in an ultra-high shear mixer. Applications range from specialty adhesives, coatings, pigmented inks, silicone emulsions, electrode pastes, polymer suspensions, nanodispersions, ceramic slurries and lubricants to food emulsions, sunscreen lotion, cosmetic and pharmaceutical creams. The X-Series generator (US Patent No. 5,632,596) consists of a precisely-machined stator with concentric rows of teeth and a matching rotor turning at tip speeds over 11,000 ft/min. Process fluid enters the center of the generator and accelerates outward through channels in the intermeshing teeth of the rotor/stator. This subjects the product to intense mechanical and hydraulic shear — and thousands of shearing events in a single pass. Shown is the newest design “X-5” X-Series model. The rotor/stator gap can be controlled through an external shimming arrangement for fine-tuning shear input. Wetted parts are stainless steel type 316 polished to 150-grit finish. 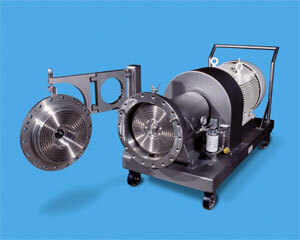 The standard mix chamber is designed for 150 psig internal pressure at 250oF. X-Series rotor diameters are offered in 3”, 6”, 9”, 12” and 15” for different throughput requirements. A high-performance cartridge-type double mechanical seal with barrier system is supplied on all standard units. Options for gas seals, sanitary connections and mix chambers, heating/cooling jackets, and Hastelloy, titanium or hardened stainless steel rotor/stator sets are available. Services include no-charge mixing demonstrations, a flexible trial/rental program and optional factory acceptance testing.